I’m gonna be honest with y’all. Before today, I had never been to Las Vegas, despite being in my 30s. Didn’t go in high school. Didn’t go when I turned 21. Didn’t go during college. Didn’t go when it was time to say “goodbye” to my 20s. Didn’t go when it was time to say “meh” to 30. 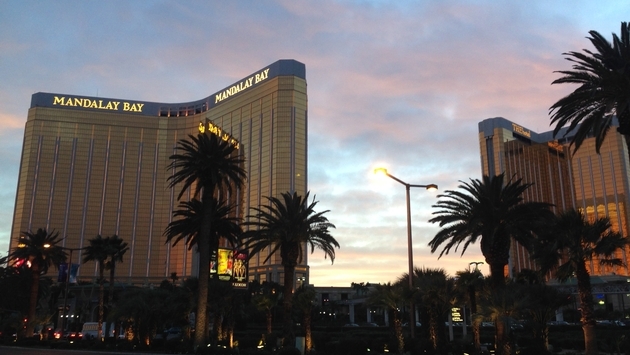 Maybe it’s not that big of a deal, but I do find it odd that the only reason I have finally made it over to Vegas is because I’m here for business (yes, business, and, no, that wasn’t me you saw swinging from the chandelier…in the morning). Thing got started pretty quickly when I checked into one of the MGM Grand’s rooms, which boast stunning views of the Strip. One look out that window and I believed in magic…or, that could have just been the enlarged head of David Copperfield playing mind tricks on me from across the way. Anyway, from there, I headed over to ARIA Resort & Casino’s Five50 pizza bar for lunch. 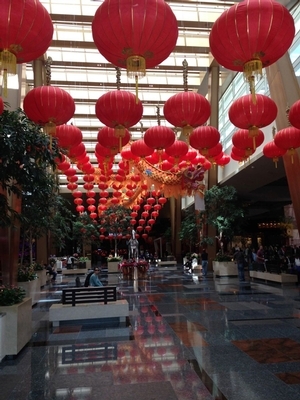 But before I got there, I passed through the main entrance and lobby of ARIA. 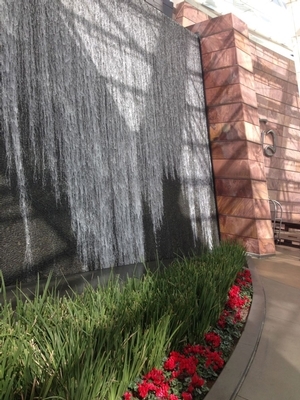 Running along the sides of ARIA's main entrance are man-made waterfalls. Matching male and female Kirin statues welcome you, meant to balance your energy and bring you luck. 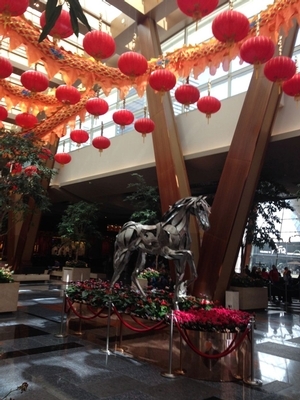 In the lobby, Chinese lanterns and dragons are strung above the main walkway, and a metallic horse gallops in the center of it all. Right from the start, you know ARIA values art. That's why it wasn't exactly a surprise when, upon reaching Five50, the restaurant boasted some interesting art of its own. A mural splashes hundreds of photos from the 1940s to the 1960s along Five50’s walls, depicting the youth rebellion and featuring icons like James Dean. Five50 has a casual feel to it, but it’s also spiked with some punch. Then you get to the food. Five50 is Shawn McClain’s second creation at ARIA (the first being the popular Sage). McClain, a James Beard award-winning chef, opened the restaurant in July 2013, continuing his tradition of offering high-quality, fresh, organic food. I had the chopped salad, the green goddess salad, garlic bread, housemade meatballs and—to top it off—the Gotham pizza, which includes, pepperoni, sausage, salami, mozzarella and Grana Padano cheese (a customer favorite). It was all delicious. Five50 also boasts an incredible variety of craft beers, and the restaurant is constantly changing its brews with the seasons. On the menu I had, I counted 12 different drafts and 37 different bottled beers (17 domestic, 18 international, two gluten-free). That’s not including the selection of ciders, cocktails and wines available. Hosted exclusively by Mandalay Bay Resort and Casino, the 90-minute theatrical, acrobatic production is the second project between Cirque du Soleil and The Estate of Michael Jackson, picking up where the wildly popular “Michael Jackson THE IMMORTAL World Tour” left off. I cannot say enough about this show. This is one of the most impressive shows I have ever been to, and many have said it’s their favorite Cirque du Soleil show of all time. Created by Jamie King, the show features 63 performers/acrobats. That’s a big number in itself, but you could swear that there are literally hundreds of people on stage. There is so much going on, so much genius choreography and artistry. You could seriously focus on just one area of the stage during the whole show and be mesmerized. It’s one of those shows where you can’t possibly see everything that is going on, but whatever your eye attaches to is a sight to behold. You could write a book just describing everything that takes place. You can also tell an incredible amount of thought and detail went into ONE. This isn’t just an outstanding tribute to Michael Jackson himself (complete with a vast collection of his most famous and influential songs), this is a tribute to humanity. There is no way this show won’t affect you deeply. How it affects you depends on who you are, but—truth be told—you don’t have to be a Michael Jackson fanatic to feel as if you’re floating on a cloud by the end of it. It’s almost a spiritual experience in a way—you know you’ve been affected deeply and you almost feel as if you’ve learned something about life along the way. This isn’t hyperbole; this is really how I felt. You get the feeling that if this show just ran in the back of everyone’s mind as they went along their day-to-day lives, there would be no need for drugs, there would be no need for escape, because the show procures a euphoric state and a sense of peace and tranquility in itself (if only Hunter S. Thompson could have seen this). Another thing: There are a lot of shows out there now that have the resources and the money to create a fantastic light show and production and can mesmerize you just by using state-of-the-art special effects, but Michael Jackson ONE is more than that. While the special effects are indeed extraordinary and a part of what makes the show so special, it is the way they are incorporated into the production that makes ONE stand out. Even with the non-stop array of acrobatics, lighting effects and pyrotechnics, the show never seems overwhelming because everything flows together in such a seamless rhythm. Every little movement, every effect, is done with a specific purpose. One thing’s for sure: Michael Jackson ONE was a fitting way to cap off my first day ever in Vegas, and it truly gives a sense of what the city can exclusively offer.